Add dried mung beans to a bowl, cover with water, and let soak overnight. The next day, drain and rinse the mung beans. Add them to a pot filled with fresh water and cook over medium heat for approx. 17 – 20 min. or until soft. Drain. Halve olives and finely slice green onions. Pluck mint leaves from stem and finely chop them. Add cooked mung beans, olives, green onions, mint, half of the white wine vinegar, lemon juice, and olive oil to a bowl. Season with salt and stir to combine. Set mung bean salad aside. Add lentils to a pot with salted water and bring to a boil. Reduce heat and cook over medium heat for approx. 10 – 12 min. until soft. Drain and set aside to cool slightly. Peel and finely dice onion. Chop parsley and chives. Grate Kaşar cheese. Beat some eggs in a bowl and season with ground cumin, salt, and pepper. Add onion, cooked lentils, Kaşar cheese, breadcrumbs, parsley, and chives to the bowl and stir gently to combine. Heat some olive oil in a frying pan and add lentil mixture a spoonful at a time to form cakes. Fry on each side for approx. 5 min. or until golden brown. Heat remaining white wine vinegar and water in a pot and bring to a boil, then reduce heat and simmer. Crack each egg into a bowl, keeping egg yolk intact. Then carefully poach eggs in batches. Cook for approx. 3 – 5 min. and remove with a slotted spoon. 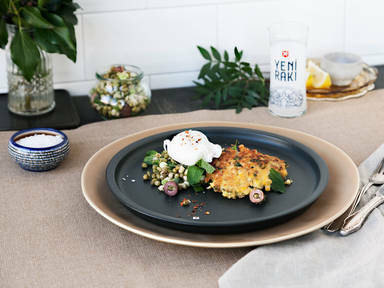 Serve lentil cakes with mung bean salad and top with a poached egg. Season with Fleur de Sel and chili flakes if desired. Garnish with some more fresh mint. Enjoy!